Roasted Yam is one of the most popular street foods in Nigeria. 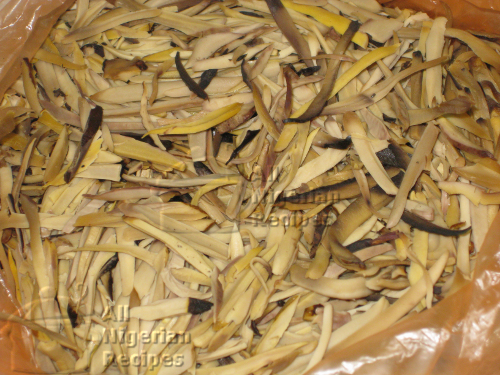 It is prepared with the white yam with a brown bark. Peel and cut the yams into 1 inch thick pieces. Wash and soak the yam pieces in salted water overnight. Put it in the fridge so they do not ferment. This soaking helps keep the inside of the yam moist during roasting. If you want to roast the yams in the evening, you can soak them in the morning. Just before you roast the yams, cut the onions into tiny pieces. Pour out the water used in soaking the yam pieces. Add some salt and toss to distribute evenly. Place the yam pieces flat on the oven rack, set the oven to grill (broil) and roast at 150°C (300F) till the top side of the yams are light brown. Turn the yam pieces to roast the underside too till they are light brown all over. When the yams are almost done, you can increase the temperature to 180°C (350F) so that the outside of the yam pieces will be very crunchy. There are many ways to go about it. You can roast one side for 10 minutes, turn and roast the other side for 10 minutes etc. I roasted mine for a total of 30 minutes, increasing the temperature when the yams are almost done. Your own time may vary depending on the type and heating capacity of your oven. They are done when the inside of the yams are moist and well done and the outside is light brown and crunchy. 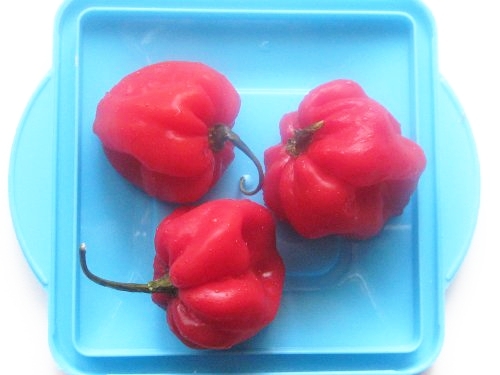 While the yams are roasting in the oven, pound the pepper, diced onions and ukpaka in a mortar till a smooth blend is achieved. You can also use any food processor that will allow you blend ingredients without adding water. When smooth, transfer to a bowl and add salt and palm oil. Stir well and the pepper sauce is ready. Your roasted yam is ready! 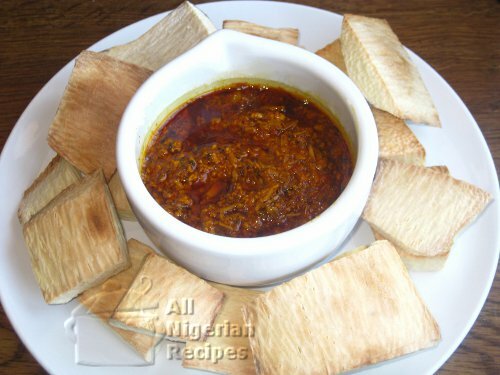 To eat, dip the pieces of roasted yam in the pepper sauce and chew. Wash it down with a cold drink.